5.4-ounce, 100% Cotton t-shirt with PTA logo on front screen print on front and the hashtags #Enough and #EndGunViolence on back. Choose Ground Shipping at checkout and you will receive expedited 2-3 day Priority Mail shipping! April 20, 2018 is the 19th anniversary of the shooting at Columbine High School in Colorado. 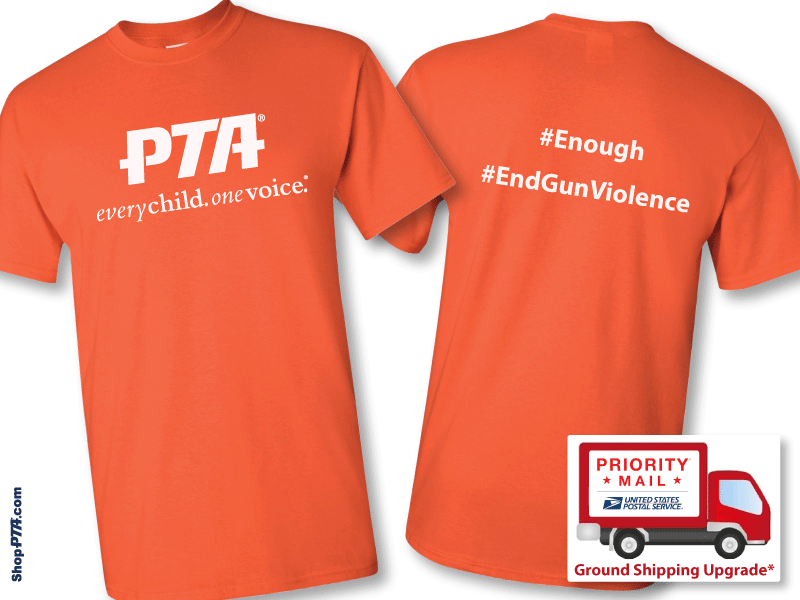 National PTA is encouraging PTA members nationwide to wear orange on April 20 to mark the anniversary and as part of its advocacy to demand change to eliminate gun violence in schools and communities. For several years, the color orange has been associated with gun violence awareness and prevention efforts, as it is the color hunters wear in the woods to protect themselves and others.